December is here! You know what that means, right? Lots of Christmas and holiday creations. How about a Christmas creations in pallet style? I grabbed a pallet board and lightly sanded the wood to remove all hairy like wood fibers. I have pallet boards with more hairy fibers then my husband has on his head. Shh, don’t tell him that. But, it’s true! Some of the boards need a lot of sanding before you start any project and this was the case with this project. It’s an easy fix with a palm sander. 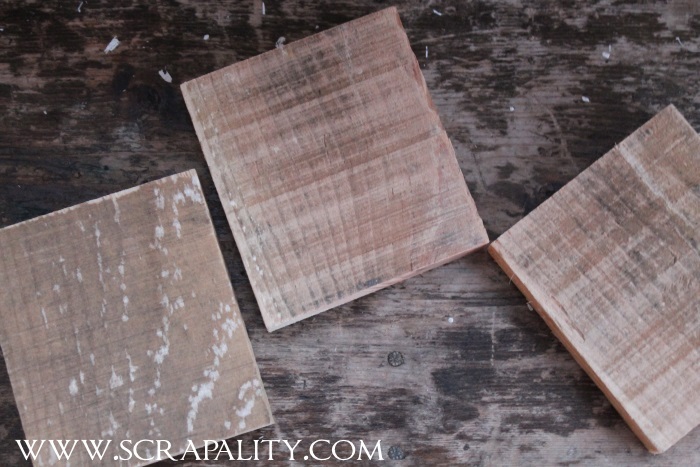 After sanding, cut the boards into smaller pieces. I simply eye-balled the size I wanted and then cut each piece the same size. No measuring needed, just cut a way. Christmas trees are my favorite decoration for Christmas. I’m not a huge holiday decorator, but when it comes to the Christmas tree, I could have one for every room. I started by painting a tree using green and brown paint. Then, I added snow to the branches and to the ground under the tree. Using the tip of my brush, I added the heavy snowfall. To finish it off I added a clear coat glitter paint to the branches and in between. After the paint has dried completely, just seal with poly to protect. I hope everyone had a wonderful week. For those here in the US, hopefully you have recovered from the turkey coma and are ready to celebrate the upcoming winter holidays. 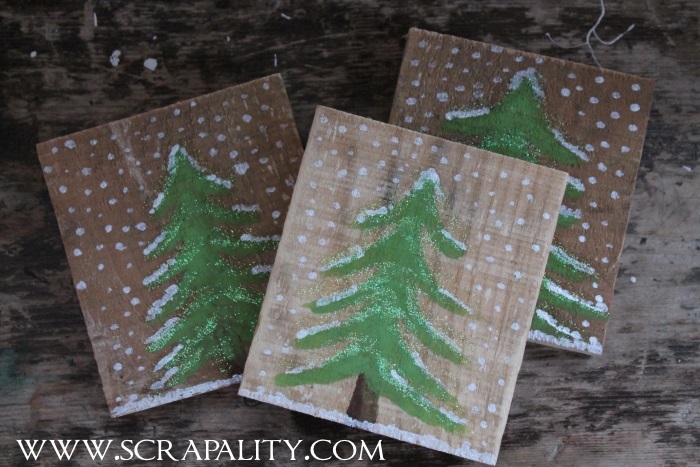 Stop back this week for Scraptastic Saturdays to share your holiday creations. Thanks for stopping by. I’m sharing this post with some amazing linky parties. These are sweet looking. Another cool project made from pallet boards and you can never have enough coasters. This is a perfect Christmas Gift Idea! I would love for you to share a post on my Meet Up Monday Blog Party! This idea is super cute for the holidays, and an excellent gift idea. Love it! I’d love for you to share this at our Coffee and Conversation link up. We have a new party every Wednesday so feel free to join us tomorrow. I know our readers would love these. Glad I found your link over at 3GLOL! Stopping by from the Lou Lou Girls link party. We love this! Such a great gift idea too. Great gift idea! I love it! 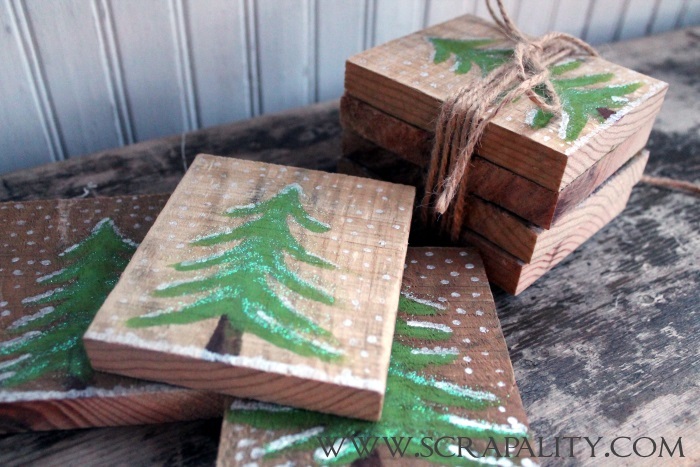 What a cute way to use up scrap wood, and these could be used all winter long. Thanks for sharing! you male it sounds so easy 🙂 they are gorgeous!! These are adorable! and so artistic! They remind me of Bob Ross trees, which is awesome! Great coasters! I love Christmas Trees too. Visiting from Project Parade. Also started following you on FB and Pinterest. Super cute idea. Thanks for linking up to Project Pin it. I will be pinning this to the Project Pin it board on Pinterest. These are so cute, and I love how you remind me that they don’t have to be measured out…I think I make some projects too difficult sometimes and am scared to just try them. Thanks for your ideas!! I saw your idea on the linky on Living Well Spending Less. This is such a cute – and functional – idea. Great for all those cups at parties that get set down just anywhere. These are 100% adorable! You should seriously sell these! I’m completely sure my painting-challenged skills would make these turn out looking ridiculous, but I bet a lot of not-so-crafty people (like me!) would love to have these on the coffee table through the holidays! 🙂 Love them! These are so cute and creative! Would make a great gift for the holidays! These are super cute! I actually have a pallet sitting outside, waiting for me to do something with it. What a fun idea! The coasters would be perfect for gifts. Thanks for sharing with SYC. I love this idea! I’ve been looking for some DIY home projects to make as gifts. Stopping by from the Frugal Crafty Home link up. I seriously love these, and I totally want to make them now! I’m featuring it on Worthwhile Wednesdays tonight! What a great idea! There are so many things you could do with these! Perfect for decorating and gifting! So cute and simple! I love these! I have some scrap wood in my garage and my wheels are turning!! Thanks for sharing at Fridays Unfolded!! You are a genius, and these are gorgeous! Thanks for sharing with us at Mommy Monday! Cute cute cute! Thanks for linking up at the #homematters linky party! We hope to see you again this coming Friday! Popping back in to let you know I am featuring these on Fridays Unfolded this week!! Thanks again for partying with us! These are so cute! Thank you so much for sharing at The Found & Foraged Linky party. I hope you will come by to see us again! The party starts tonight at 8 PM CST!